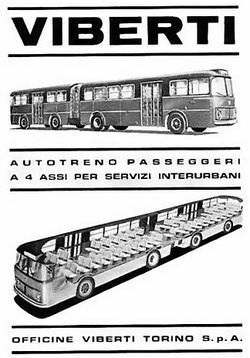 Officine Viberti was an Italian manufacturer of trailers, coach and bus bodies and Viberti mopeds, better known by its integral Monotral chassisless self-supporting coaches and buses. It was based in Turin. Viberti made the Vi-Vi moped from 1955 until 1957 in alliance with the German motorcycle manufacturer Victoria. Established in 1922 in Turin, VIBERTI built its reputation on an exceptionally complete and vaste production of both civilian and military transport vehicles, supplied, among the others, during the bleak years of the World War, to the Italian Armed Forces, and to almost all transport companies that were starting regular service in Italy and abroad. A few years after its establishment, VIBERTI forcefully became Italian market leader and in the aftermath of the World War, the company continued its growth until it achieved an absolute market leadership in Europe also. 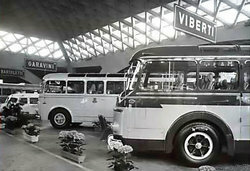 The cooperation with FIAT (now IVECO) started in the 20s constantly characterized the almost 80 years’ life of the historic brand VIBERTI. 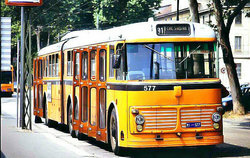 Since the very beginning, and still today, the company has been market leader in Italy. The pavilion of the fair in Turin in which they are clearly visible models presented at the bus stand Viberti in March of 1954.